It shows that for the last 20 years, the Sun's output has declined, yet temperatures on Earth have risen. "All the graphs they showed stopped in about 1980, and I knew why, because things diverged after that," he told the BBC News website. "You can't just ignore bits of data that you don't like," he said. The scientists' main approach on this new analysis was simple: to look at solar output and cosmic ray intensity over the last 30-40 years, and compare those trends with the graph for global average surface temperature, which has risen by about 0.4C over the period. The Sun varies on a cycle of about 11 years between periods of high and low activity. But that cycle comes on top of longer-term trends; and most of the 20th Century saw a slight but steady increase in solar output. However, in about 1985, that trend appears to have reversed, with solar output declining. Yet this period has seen temperatures rise as fast as - if not faster than - any time during the previous 100 years. "This paper reinforces the fact that the warming in the last 20 to 40 years can't have been caused by solar activity," said Dr Piers Forster from Leeds University, a leading contributor to this year's Intergovernmental Panel on Climate Change (IPCC) assessment of climate science. The IPCC's February summary report concluded that greenhouse gases were about 13 times more responsible than solar changes for rising global temperatures. But the organisation was criticised in some quarters for not taking into account the cosmic ray hypothesis, developed by, among others, Henrik Svensmark and Eigil Friis-Christensen of the Danish National Space Center. Their theory holds that cosmic rays help clouds to form by providing tiny particles around which water vapour can condense. Overall, clouds cool the Earth. 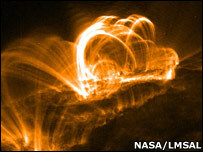 During periods of active solar activity, cosmic rays are partially blocked by the Sun's more intense magnetic field. Cloud formation diminishes, and the Earth warms. Mike Lockwood's analysis appears to have put a large, probably fatal nail in this intriguing and elegant hypothesis. He said: "I do think there is a cosmic ray effect on cloud cover. It works in clean maritime air where there isn't much else for water vapour to condense around. "It might even have had a significant effect on pre-industrial climate; but you cannot apply it to what we're seeing now, because we're in a completely different ball game." Drs Svensmark and Friis-Christensen could not be reached for comment.